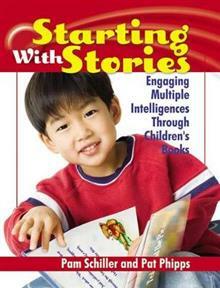 Includes more than 1,500 activities to engage kids' multiple intelligences. This work covers different intelligences to account for a range of human potential in children and adults. These intelligences are: Linguistic - word smart; Logical-mathematical - number/reasoning smart; ... read full description below. Featuring 100 cherished children's books, Starting with Stories includes more than 1,500 activities to actively engage kids' multiple intelligences (see below). It's all here - everything you need to bring the magic of good books to all areas of your busy home or classroom! The theory of multiple intelligences was developed in 1983 by Dr. Howard Gardner, professor of education at Harvard University. It suggests that the traditional notion of intelligence, based on I.Q. testing, is far too limited. Instead, Dr. Gardner proposed eight different intelligences to account for a broader range of human potential in children and adults. These intelligences are: Linguistic - word smart; Logical-mathematical - number/reasoning smart; Spatial - picture smart; Bodily-Kinesthetic - body smart; Musical - music smart; Interpersonal - people smart; Intrapersonal - self smart; and Naturalist - nature smart. Pam Schiller, Ph.D., is an early childhood author, consultant, and highly sought after speaker. She has written numerous articles for early childhood journals, including Child Care Information Exchange and Texas Child Care Quarterly. Pam is the author of five early childhood curriculums, eleven children's books and more than 30 teacher and parent resource books. Patricia A. Phipps, Ed.D, is the Executive Director of the California Association for the Education of Young Children. She has been a faculty member in the Graduate School of Education at George Mason University in Fairfax, VA and in the College of Education at the University of Houston.